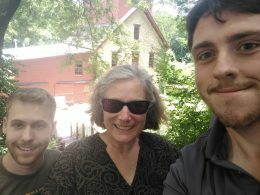 From left, Ethan Levin, Bonnie Lynn-Sherow, and Brad Galka, at Oxford Mill in south central Kansas. “Sure.” Four little letters– one small word have propelled Brad Galka into some very interesting experiences and roles during his two years at K-State in the master’s graduate program in History. Originally from upstate New York, Brad was drawn to graduate study at K-State as a great place to learn more about World War II– the interwar period especially– and the rise of domestic fascism. His thesis is nearing completion under the direction of Professor Don Mrozek and Galka plans to submit the best parts of the thesis for publication in the spring semester of 2018. And while Galka’s academic work has been rewarding and productive, it has been outside of the classroom, doing the work of a professional historian, that he will likely remember best from his time at K-State. During his 20th Century U.S. History seminar with Dr. Bonnie Lynn-Sherow, Galka was introduced to the work of the Chapman Center for Rural Studies and was intrigued by the possibility of putting his talents for research and writing to work. Dr. Lynn-Sherow was impressed with Brad’s skills, especially his research skills and his ability to absorb new information quickly and incorporate it into his thinking. After the semester concluded, Dr. Lynn-Sherow asked Galka if he was interested in working at the Center as an assistant editor for the Online Journal of Rural Research and Policy. Although it was outside of his area of interest, and he was already serving as a Graduate Teaching Assistant, Brad said, “Sure,” and his long term association with the Center began. In addition to working with journal authors, copy-editing and mastering the ins and outs of online publishing platforms, Brad enthusiastically pitched in with the Centers’ exhibit at the Flint Hills Discovery Center. There was more than enough to do, including artifact provenance, labeling of artifacts and exhibit areas and even going along with Dr. Lynn-Sherow in a box truck to rural historical societies to pick up a mail wagon (sans horses) and a giant set of blacksmith bellows. No matter the task, large or small, Brad always said “sure” and his next adventure began. It was in this same adventurous spirit that Brad stepped off campus again, this time on his own. Over the spring of 2016, Dr. Lynn-Sherow was asked to meet with the members of a public interest committee charged with the interpretation of the “Riley County 101” memorial at City Hall auditorium. Galka was interested in how the memories of WWII soldiers were to be honored and Lynn-Sherow asked if he would like to join the committee in her stead—especially now that he had some exhibit experience. Again, Brad said, “Sure” and his contribution to that memorial committee continues even now– moving through the design and implementation stage of a permanent exhibit and interactive kiosk. No one at K-State will ever be able to say that Brad Galka didn’t do things “his way” during his time in Manhattan. And if he ever decides to write a song about his time here, we hope it includes those four powerful letters, S.U.R.E.